I haven't done a Midweek Romance post in quite a while, soo...... here's for all you who need a quick idea, without much effort! 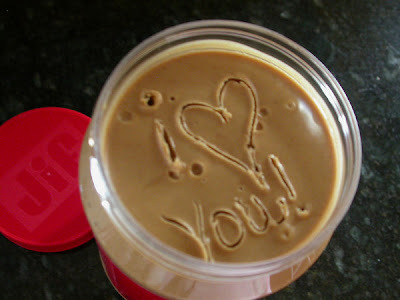 If your other half is a peanut butter lover (or maybe even a butter-tub lover), leave him a little love note on the next new container you buy. It seems like forever since I've dropped by....Another fantastic idea! You are so creative! oh my gosh! ahah I love this idea :) Thanks Cher!! you are welcome!...although, I actually found this somewhere on google, so technically, I can only take credit for posting it. :) Thanks for the comment love! I love this idea. My husband loves Peanut Butter. It's perfect, just a few short months and I can test this midweek romance on him. It'll be great. I love it! Simple and sweet! My kid has a PB&J every day! I'm totally going to do this for my wife to find! You are genius! Sheesh. My hubby mentioned tonight while we ate PB&J (yum... uhhh we're busy college students...) how much he loves to each hersheys chocolate bars with peanut butter and I thought - I should get some for him as a surprise and now with your little love note it'll be sooo much better! Thank you! haha...Kylee, I appreciate the "busy college students" status...I've been there!! It's always fun to have a surprise up your sleeve that you know he'll love, huh? LOVE your site thank you for all of the wonderful ideas!!! You are so creative! How sweet is your blog! Thanks for stopping by mine and reading about the February post office idea! I will back to yours to get some creative ideas for romance and my hubby!